Hundreds of sculptures and thousands of visitors will again populate the River Market Pavilions when Sculpture at the River Market returns for the seventh year on April 26 and 27. The sculptures will be on display in the River Market Pavilions and in the adjacent area of Riverfront Park. The works featured will include all types of media, style, subject matter, and size. Admission to Sculpture at the River Market is free. 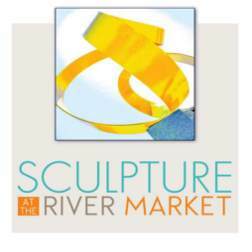 Sculpture at the River Market Market will run from 9AM to 5PM on Saturday, April 26 and from 10AM to 4PM on Sunday, April 27. This evening there will be a preview party where patrons will get the first chance to see the artwork, visit with the sculptors, and purchase sculptures. Tickets for the preview party are $100. The entertainment will be provided by Dizzy 7. Following the preview party, “Bronze and Brewskis” will take place beginning at 8:30. On Saturday at 1PM and 3PM and again on Sunday at 2PM, Segway tours of the Vogel Schwartz Sculpture Garden will be offered. There will also be food trucks set up in a special Food Truck Plaza next to the River Market pavilions. The sale and show is sponsored by the City of Little Rock and the National Sculptors’ Guild. Proceeds from the sale of artwork will fund upgrades in Riverfront Park and the River Market. Among the artists are Lori Acott, Virginia Annett, Terry Bean, Gregory Beck, Hunter Brown, Shelly Buonaiuto, Kathleen Caricof, Tim Cherry, Dee Clements, Merrilee Cleveland, Darrell Davis, Jane DeDecker, Clay Enoch, Steve Frank, Jim Green, Denny Haskew, Damian Jones, Rollin Karg, Ana Lazovsky, Bryan Massey, Ryan Mays, Julie McCraney-Brogdon, Ken Newman, James Paulsen, Ed Pennebaker, Merle Randolph, Kevin Robb, Dale Rogers, Timothy Roundy, Emelene Russell, Wayne Salge, Ted Schaal, Valerie Schafer, Adam Schultz, John Sewell, Stephen Shachtman, Kim Shaklee, Gene Sparling, Pati Stajcar, Charles Strain, Tod Switch, Darl Thomas, Michael Warrick and C.T. Whitehouse. This entry was posted in Architecture, Design, Public Art, Visual Art and tagged Adam Schultz, Ana Lazovsky, Bryan Massey Sr., C. T. Whitehouse, Charles Strain, Clay Enoch, Dale Rogers, Damian Jones, Darl Thomas, Darrell Davis, Dee Clements, Denny Haskew, Dizzy 7, Ed Pennebaker, Emelene Russell, Gene Sparling, Gregory Beck, Hunter Brown, James Paulsen, Jane DeDecker, Jim Green, John Sewell, Julie McCraney-Brogdon, Kathleen Caricof, Ken Newman, Kevin Robb, Kim Shaklee, Little Rock River Market, Lorri Acott, Merle Randolph, Merrilee Cleveland, Michael Warrick, Pati Stajcar, Riverfront Park, Rollin Karg, Ryan Mays, Sculpture at the River Market, Shelly Buonaiuto, Stephen Shachtman, Steve Frank, Ted Schaal, Terry Bean, TIm Cherry, Timothy Roundy, Tod Switch, Valerie Schafer, Virginia Annett, Vogel Schwartz Sculpture Garden, Wayne Salge by Scott. Bookmark the permalink.